Marine conservation spreads his message through award winning UW photos & videos . a collection of his photos were chosen to be on the official Qatar postal stamps. Try diving in the Red Sea 1990 the work in Sharm El Sheikh as a PADI Pro. 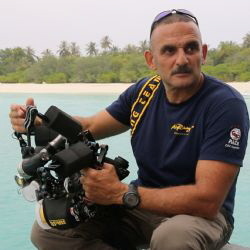 With 25 years’ experience working in the diving industry in the Middle East certified thousands divers , produced marine documentary films with BBC , Qatar TV ,Alrayan TV .Zaki prolific writer focusing his work on diving, tourism and environmental issues via conferences, seminars & related Workshops .